Blizzard warnings were posted from Colorado to Minnesota on Wednesday and wildfires were a concern in New Mexico, Texas and Oklahoma as a storm developed that could rival last month's devastating bomb cyclone. Snow was already falling at a rate of up to 2 inches (5.08 centimeters) per hour in northeastern South Dakota and southwestern Minnesota early Wednesday, with the brunt of the storm not expected until Thursday. An unusual but not rare weather phenomenon known as "thunder snow" — snow accompanied by thunder and lightning — was reported in central South Dakota. The looming spring blizzard in the Rockies was impacting everything from flights to school classes to baseball. The storm was expected to rival last month's "bomb cyclone" — an unusual weather phenomenon in which air pressure drops rapidly and a storm strengthens explosively. 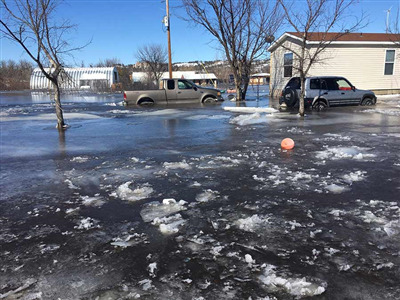 Last month's storm dropped heavy snow and led to massive flooding in the Midwest that caused billions of dollars in damage in Nebraska, Missouri, Iowa and South Dakota.